A Kenya beach wedding is of course a very romantic idea. Saying the big yes to the person you love on the shore of the Indian ocean, on a white sand beach with palm tress and everything… But if you look at the practical side, what are the pros and cons? Convenience - You can combine your wedding and honeymoon in one place. This creates a relaxed atmosphere around one of the most important events in your life – you don’t have to travel across continents right after the marriage ceremony. 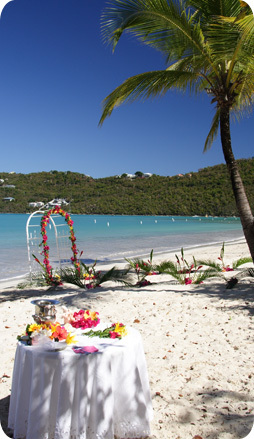 You can hold the marriage ceremony and the reception right at the beach. Fun - A beach wedding creates a very special romantic yet casual atmosphere. Everyone present will enjoy himself, even the kids! There are no rules for a beach wedding, so you can shape it anyway you like. You can let your personality shine through. 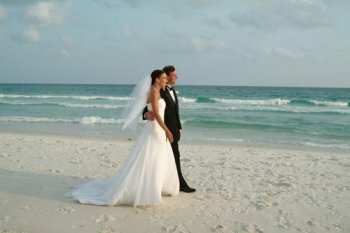 Costs - Though you can make it as expensive as you like, a beach wedding can be much cheaper than having it elsewhere. While this may not be the most important thing you want to think about, why not include the financial aspect as well? Weddings are expensive these days, and many people borrow to pay for it. While the basics may be cheaper in Kenya, luxury is expensive there as well. But do you want to start your married life deeply in debt because of one party? Privacy - If you’d like to marry in a private setting, with just the two of you or a few very special persons, then getting married in another continent will make sure in itself that you will have all the privacy and peacefulness you’re looking for. The Weather - You’re outside and this means Mother Nature rules. However, in Kenya it’s sunny all round the year and if you’re picking one of the two dry seasons, there will be very little chance of rain. Here’s more about the weather in Kenya. You also have to think of the tide during the ceremony, and how the beach looks like then, about the sun, bugs and other little creatures that may annoy you or steal your food. Other People - You will want to have some privacy and quietness around your ceremony – or at least a piece of beach large enough for you and your guests. In Kenya, this shouldn’t be a problem. Many beaches are very quiet by nature, and many resorts and hotels have their private secluded beach. Legal Stuff - Getting married in Kenya requires some paperwork, even more so when you want the marriage ceremony to take place outside official Registrars Offices. Read all about practical and legal details of Kenya weddings here. Beach Rules - Apart from marriage laws, the beach may also have some rules. Can you light candles or fire, play music, and drink alcohol there? Until how late can you party? If you're looking for a good wedding planner to organize your wedding, I recommend Ivory & Pearls, run by my fellow countrywoman Irene Okech who got married in Kenya herself. Read her story.